Yes, I am still here. Things have been a bit, um, hectic since I last posted. I dealt with the Sheriff’s office and pressed charges against a man who a neighbor caught stripping everything he could from the existing house on the property. He has since served 30 days in the county jail as a result. The removal of these was severely hampered by the hard winter this year. 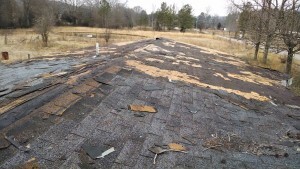 As a result, it was not until the end of February that I was finally able to start removing the shingles. Since this picture was taken, my dad and I have completed over half of the roof, despite a late season snowstorm that further delayed us. and the fact that we are both “getting too old for this” lol. Then the roof removal was put on hold yet again. On March 28th, my first daughter came into the world. Since then, my schedule has been upended, and a full night’s sleep is a pleasant,distant memory. I won’t get into the details, but it has totally changed our lives. I wouldn’t change it though! Luckily, our daughter has started to get on somewhat of a sleep schedule, and it looks like I may be able to finish removing the roof in the next week or so, weather permitting. Once the roof is off, the Fire Department will figure out when they can get the most volunteers together, and they will light it up. Once this is done, I get to clear the remaining debris, and will end up with a blank slate to work with. I have been working on plans off and on, as time allows, but still do not have things ready for putting up for sale. Hopefully, soon! I also was interviewed by a reporter recently, who picked my brain on tiny houses, the movement, and other related topics. I don’t know if the article will get written, but it was nice to be able to share my knowledge. Until next time, I will share the next book on my reading list. I expect it will fill in some of the gaps that I have from helping government agencies with renewable projects in my day job.